1. At the track, open them up for full flow and an extra 10-15HP. **Check your local sound ordinances. We can't be responsible for 'disturbing the peace' citations." 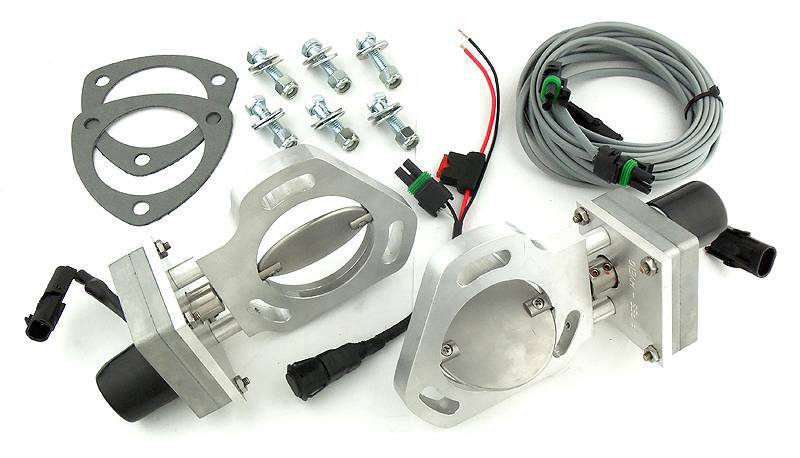 This electric dump kit connects to any standard 3" collector including all of the following Pypes products regardless of the size of your exhaust system. In flow tests, our standard valve opening performed just as good on 3" and even 3.5" exhaust systems. Because we only make one valve, we have been able to lower the price without sacrificing quality or longevity! YVX10S YVX13S XVX10, XVX10S, XVX13, XVX13S, XVX10F, XVX13F. Wiring and switch is included. Allows you to partially or fully open your exhaust from a switch you can mount anywhere in the car. Perfect for when a quick 10-20 horsepower is needed. Made in USA of CNC machined billet aluminum and a high quality motor. Lifetime warranty !!! Another Pypes exclusive! They were well wrapped and boxed for protection. The welds are very neat and clean. This company is the real deal. I ordered some cut outs about two years ago and the switch went faulty. They quickly send me a few more and those also went bad over the course of a year due to the design. Just recently it went out again and they are now sending me the new and improved switch. For free. I will recommend them to anyone I talk to and I will be getting their cut outs for my 73 split bumper Camaro. -Guy P.